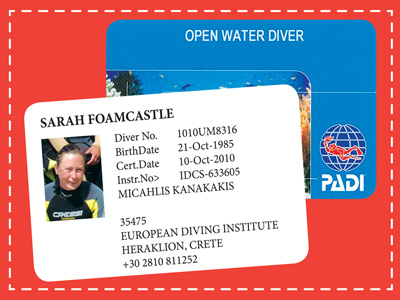 Eurodiving works in association with the diving organizations : PADI, IANTD and SSI. We offer courses for all levels - from Scuba Diver until Assistant Instructor and lots of technical courses. The certification is a card with global recognition. We have all supports wich are necessary to learn and upgrade your diving level in best conditions. Theoretical lessons take place in our classroom. It’s an ideal place to watch also the PADI videos and to write quietly your exams! Pool sessions and training in case of bad weather take place in a swimming pool, less than 10 meters from the diving center. Open sea sessions and specialties take place in the appropriate dive spots we chose. The Scuba Diver is a 2-3 days program representing half of the first diving level PADI Open Water Diver. You are going to make your first steps in the marvelous world of Scuba Diving. At the end of the course you’ll have completed the first three out of five sections of knowledge development, resulting to limited certification. You can complete in the future the Open Water Diver in any other PADI diving center. You will learn: How to dive, always under the supervision of a certified Instructor to a maximum depth of 12 meters. 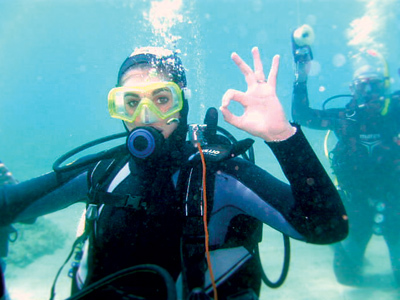 To feel comfortable under water by improving your buoyancy skills. To be familiar with your equipment, the underwater fauna and flora and you will learn to deal with common problems that may occur. You will use all the basic scuba diving equipment: fins and mask, buoyancy control jacket, air tank, weight belts, ect. Open Water Diver is the first complete level in the diving career. It’s a 4-5 days course depending you. This is a comprehensive course that includes serious diving theory and practical skills that will build up yourself confidence. It’s the core of the diving programs. The course starts with basic theory in our classroom, followed by 5 confined dives (sea or pool) in Lygaria and then 4 open water dives including one from the boat with 18mmaximum depth. Anyone who is in good health, reasonably fit, and comfortable in the water can earn an Open Water Diver certification. You must be older than 15 years old to begin the Open Water Diver program. 12 year old children can eran the Open Water Diver Junior and may only dive with a certified parent or guardian to a maximum depth of 12 meters. Scuba diving experience is endless. You can dive in many different places, under different condition all overthe world. The Adventure Diver gives you the chance to learn more things about your hobby, Scuba Diving. 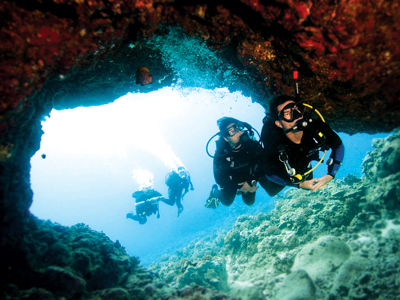 With the Adventure Dives, improve your knowledge and your diving level! It’s a 1-2 days program while you will discover new faces of diving. You like photography? You want to go deeper? To improve your buoyancy control? 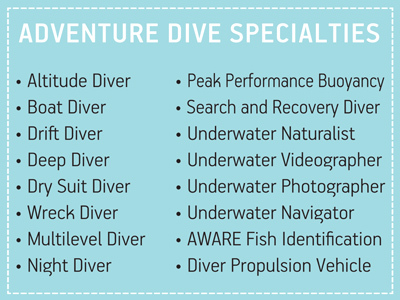 Choose 3 Adventure Dives in the list of Advanced Open Water Diver and let’s go diving! In the future, you can complete the Advanced Open Water Diver in any diving center PADI. Advanced Open Water Diver Course is the next level after the Open Water Diver Course. During this course you will be taught about deep dives, underwater navigation and 3 other specialties of your choice to improve your level. Its a 2-3 days course , including the theoretical and practical part of the 5 specialties. After your five dives, you’ll be more experienced, feel more comfortable simply enjoy diving more because you will understand the underwater environment better. This certification includes five Adventure Dives, the Deep Adventure Dive, the Underwater Navigator Adventure Dive and three of the following list.